The bond market is warming up in Singapore. Over the past few months, we have seen bonds like the Temasek 2.70% T2023-S$ Bond as well as the 4.35% Astrea IV Bond by Azalea Asset Management. Bonds are generally considered to be less volatile compared to stocks, but this does not mean that they necessarily come with low or no risk. With the issue of the Singapore Airlines Retail Bond 2019 (SIA Bond 2019), here’s what Singapore investors need to know before deciding if they should invest. #1 What Exactly Is The SIA Bond 2019? Singapore Airlines is, as its name suggests, Singapore’s national airline. It has gotten numerous international accolades over the years, being named the World’s Best Airline at the 2018 World Airline Awards. For many Singaporeans, Singapore Airlines is one of the go-to airlines of choice and is closely tied to the Singapore identity. 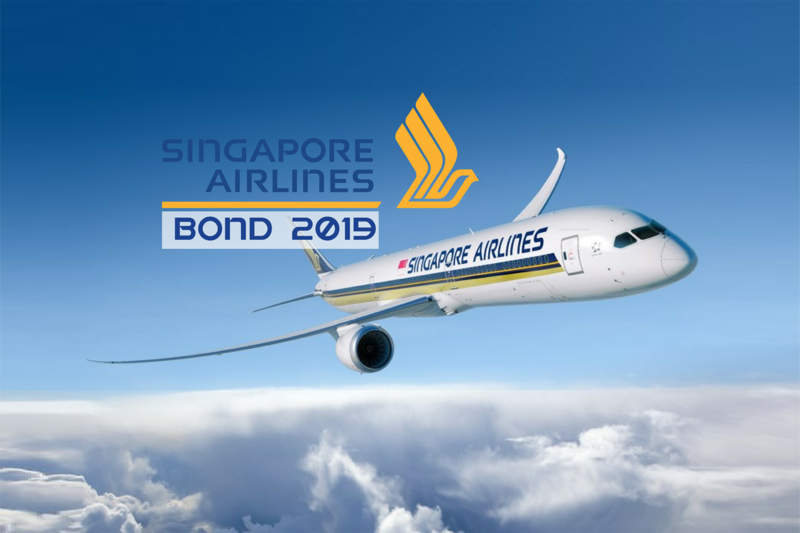 Singapore Airlines (SIA) is issuing their own SIA Retail Bond 2019, an interest-bearing debt securities. Investors will receive a fixed interest of 3.03% per annum, semi-annually until the maturity date of the Bonds. SIA is offering up to S$300 million to the public. Should this public offer be oversubscribed, there is a possibility of SIA increasing the offer up to a maximum of S$750 million. #2 What Is The Coupon Rate And Bond Maturity? The coupon rate for the SIA Bond 2019 is 3.03% per annum. This works out to be about $15.27 per $1,000 of bonds purchased. Coupon payments will be made twice a year, on 28 March and 28 September every year until bond maturity where you will get back your principal amount as well. The first payment will be made on 28 September 2019. The SIA Bond 2019 is a 5-year bond, maturing on 28 March 2024. Upon maturity date, if not earlier redeemed by SIA, SIA is obliged to redeem each bond at 100% of its principal amount. #3 How Much Must I Invest? The bonds are issued in denominations of $1,000. This means that the minimum amount to invest in the SIA Bonds is S$1,000. Investment amounts above $1,000 have to be in multiples of S$1,000. This means that you cannot invest in odd lot sizes. In addition, trading the SIA Bonds on the market will be in $1,000 lot sizes as well. #4 Is My Money Guaranteed? No, your money is not guaranteed or backed by Singapore Airlines, Temasek or the Singapore government. Although Temasek is a major shareholder of Singapore Airlines holding about 56% of its shares, this does not mean that your money is guaranteed. The bonds are not secured and there is no assurance that SIA will have sufficient cash flow to meet payment obligations. This means that there is still the possibility of SIA defaulting and failing to pay the interest due or repay the principal sum at maturity. This is a possibility that some investors realized, unfortunately, with the recent Hyflux saga. #5 How Safe Is The Bond? The SIA Bond 2019 comes with a fair bit of risk. In an industry that is fiercely competitive, Singapore Airlines has been facing strong headwinds in recent times. Singapore Airlines is an international full-service carrier. Besides facing competition from other full-service carriers, low-cost carriers are able to offer consumers more affordable prices that are able to compete in both short-haul flights and long-haul flights. While SIA own their own low-cost carrier Scoot, Scoot has been plagued by negative news, such as flight delays, in recent months. It is also an industry that is highly affected by oil prices. For example, a change in price of 1 USD per barrel of jet fuel would have affected the Group’s annual fuel costs by S$53.2 million. Other risks faced by Singapore Airlines include regulatory risks, risks of equipment failure and potential damage in reputation. It also does not help that Singapore Airlines’ have seen their profits falling, with financials over the past few years being far from excellent. #6 What Is The Bond Rating Of SIA Bond 2019? The SIA Bond 2019 is not rated by any of the 3 rating agencies, Standard & Poor’s, Moody’s and Fitch. However, this does not mean that the bond is of poor quality, this just means that they were not rated. #7 Where Will My Money Go To? The net proceeds from the issuing of the bonds will go towards funding SIA’s aircraft purchases as well as other aircraft-related payments. The bonds will be listed on the Main Board of the Singapore Exchange Securities Trading (SGX-ST). This means that the SIA Bonds can be bought or sold in the market upon listing. This also means that the market price of the SIA Bonds could fluctuate above or below its issue price, depending on market conditions. The SIA Bonds is expected to be listed on or about 29 March 2019 at 9am. Similar to the minimum denomination of $1,000, each board lot will comprise S$1,000 in principal amount of the Bonds. Keep in mind that while the bond will be listed, it is possible that the market for the bond to be traded might not be active. #9 Should I Invest In The SIA Bond 2019? This is a question only you can answer. Ultimately, it boils down to weighing the risk and returns. This is not a bond that is risk-free. Are you willing to undertake the risks faced by the company for the 3.03% per annum returns? Some investors could be looking to diversify their portfolios through bonds. However, this is definitely not the only bond on the market, neither will it be the last. Deciding whether to invest in the SIA Bond 2019 also also depends on many other factors, such as capital availability, opportunity cost and overall financial situation. #10 How To Invest In The SIA Bond 2019? Applications opened on 9.00am on 20 March 2019 and will close this Tuesday, 26 March 2019 at 12.00pm. All applicants will require a Central Depository (CDP) Account which has to be linked to your bank account with the direct crediting service (DCS). You can invest at any DBS/POSB, OCBC, and UOB ATMs or through the internet banking of the participating banks. DBS/POSB account users can also apply via the mobile banking application. Applications through DBS/POSB and OCBC can be submitted 24/7. However, applications through UOB (for both ATM and ibanking) can only be submitted between 6am to 9.30pm. Do note that an application fee of $2 per application will be charged. This fee is non-refundable. Key information on the SIA Bonds can be found here. Additional details can be found in the Information Memorandum as well as the Pricing Supplement and Product Highlights Sheet.